Local instability: Two balls that start very close to each other quickly develop very different motions. This is because small disturbances acting on the balls are amplified by unstable system behavior. There are many possible sources for these small disturbances, such as small breezes of air, differences in the bounciness between balls, or an imperfect paddle surface. 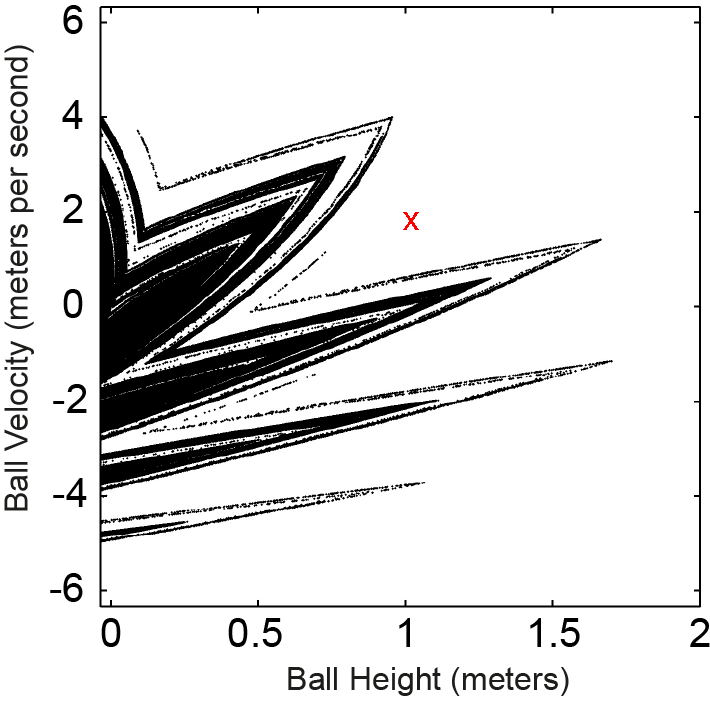 Strange attractor: Even though the ball behavior is locally unstable, we find that the balls remain within a limited set of positions and velocities when moving chaotically. This set is called the strange attractor of the system. This set is visualized below. The following illustration depicts the strange attractor of the chaotic ball motions. Every black dot corresponds to a measured ball height and velocity. The values are measured when the paddle is at the lowest point of the motion that induces chaotic ball motion (see video to watch this paddle motion). The attractive nature of the black set means that if a ball starts outside the black set, for example at the red cross, it quickly converges to the black set. At the same time there is the local instability: if two balls are very close to each other on the black set, they very quickly diverge from each other. This is a key property we use for controlling balls to desired juggling patterns, read more about this here.